3rd publication, fully prepared by European Center for Youth Initiatives, based on the implementation process of bilateral project ‘Open Your Minds, Leave Stereotypes!’ in cooperation with partners from Ukraine under Polish-Ukrainian Council of Youth Exchange Programme. 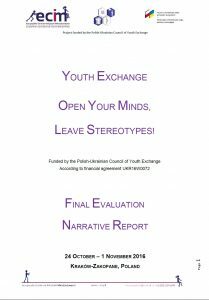 Report showing the whole process, tasks within activities, their aims, is using data collected during Youth Exchange implementation, daily evaluations made by participants, online questionnaires results as well as photos and graphics showing character and category of each activity. 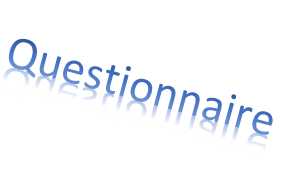 Publication is one of the key elements of complex project evaluation. This project has been very informative and valuable for me as we had a lot of interesting workshops, simulation games and exercises. For now I definitely have no hesitation in a bright future of Polish-Ukrainian relations as we have so many things in common. It was a great experience and within these 9 days we understood that Ukrainian and Polish people have a lot in common. Also it was a great chance to get acquainted with Polish culture, traditions, thoughts, habits as well as exchange experience. This project was very exciting, informative and memorable for each participant and I would love to take part in such kind of programs organized with Polish-Ukrainian Council of Youth Exchange. I was very suprised with organisation of this project! Also i’ve learned how to work in group with people from another country. Nice experience! This is not the first project, I have ever participated in. However, this is another one which made very good impression on me. As always, Marcin and Ola did a great job to make staying in Cracow and Zakopane for all of us a great experience. I learnt a lot about Poland and Ukraine. I haven’t known that we have as many things in common. It was big surprise for me. Everything was organized good, and I felt relaxed and peaceful during the whole exchange. Thank you! Thank you for doing such a great job. This project motivated me to be more open for life and learn smth new everyday. The idea of the project is really interesting. We live in a coutries which have a lot in common, but mostly people in Poland and Ukraine don’t know much about their neighbours. We have similar culture, languages, we should cooperate in politics. Leaving stereotypes is very important in our lifes, we shuldn’t jugde people and nations if we don’t know them. Project was very well organizated in a curious way, which let everyone of us fully involve into it. Thanks to organizators, hope that we will cooperate in the future and have opportunity to participate in such a projects! It was one of the best project that I attended, everything was really well organised and the activities were very interesting and useful for me. I opened Polish culture for myself, got to know great people and visited very beautiful places in Cracow and Zakopane. I’m very thankful to organizers for everything! I will miss all these amazing people and unforgettable time that we spent together! One of the best projects ever, especially because of people who brought their great energy and contributed in the final shape of all activities. Seeing people, both from Poland and Ukraine, working together and having so many topics to discuss, to have fun about, as well as huge will of creating big things, gave me hope that new Polish and Ukrainian generation is going to build common future above all existing borders and stereotypes. All activities which we have had at the project were well. Our organizations make feel us like at home. Time that we spent in Cracow was very cool because we had an opportunity to visit a lot of historical places connected with Polish Ukrainian relationship. Trip to Zakopane was also good, there we had seen Goral’s culture which is amazing and Polish group present us their traditions, culture and history. To sum up I want to say it was one of the most beautiful project that I have visited. It was very big pleasure to met all people on this project and I will remember it for a long long time. I can say that the Youth Exchange exceeded my expectations. It was really great time spending together. We gained new knowledge, met new interesting people, were inspired to learn more about different cultures. And of course it’s really important that we became more open to other culture and nations. Taking part in the project helped me better understand my strengths and weaknesses. I was inspired and motivated for new achievements and projects. Feel happy to participated in this project, it was not first one in my life but one of the best. All participants were open, funny and intelligent, so we did not have chance to fail the project. I liked each tasks, but the most memorable for me was “Who I am?”. I can not say that I am shy person at all, but it was challenge for me to talk about my personal life with other people. To my mind, it helped our further communication. Also, our hot discussions were great! The ideas, which I heard here will always stay with me and I hope change my way of thinking. To my mind, formal education is important and helps us became a professionals but non-formal helps people to find the place in society, which is probably more important. To sum up, I can say that this project not just meet my expectations, but exceed my expectations. Just feel thankful for this chance. I am glad to have a chance to take part in this project. The topic is very actual for developing Polish-Ukrainian relations. The project’s program was very intens and there was no minute for boredom, but I didn’t regret any of it. The atmosphere was very warm and very productive , the participants were very friendly, and I was pleased to help or to make a fun with them. Thank European Center for Youth Initiatives, Society Initiatives Institute and everyone, who worked on the project! Participate in the programs, develop and travel. This is my first project. During all project I had only positive emotions. I got a lot of new experience, met incredible people, improved language, communication skills. Very grateful for possibility to participate in this incredible project. Especially very big thanks to to Marсin and Ola. Thank you very much for such beautiful way of spending time. This project was great. I learned a lot of new things, met interesting people, have learned many interesting things and have many positive impressions and had a great opportunity to explore beautiful Polish cities. I am very happy that I had a chance to meet so many fantastic people at this project. Thank you very much for this 9 unforgetable days in Cracov and Zakopane. I have extended my worldview, stopped thinking stereotypical way and I fell in love with Ukrainian culture and people of course. I will miss everybody and definately recommend that kind of projects to every students -it’s really great time! It was really pleasant feeling to make the bilateral project for the first time. Especially that it was done with amazing people who Ukrainians are! All of You are amazing! Keep doing what You want to, because each of You is worth it and You’re able to do it – it’s just enough to try and challenge Yourself and it was visible during our exchange. Every activity which we provided was great, but it’s all because of our wonderful participants! We have created the real team which is able to reach any goal and that’s the biggest success of OMLS project! It was my first project and I can honestly say that it was amazing! I met a lot of great people and I have learned how to work in team. Thank you for this incredible experience. Everything was great, hard to imagine better project and for sure I would like to go for next ones! Great people, great workshops, Poland&Ukraine neverending friendship has huge potential, and now I know it, without any doubts! Nice time with great people. Big chance to develop teamwork and language skills, and gain a lot of useful knowledge. Thank you for this opportunity! Surprises, similarities and fun are the best words to describe this project. I am glad I had this great opportunity! I met extraordinary people, learned a lot of new things and became more open-minded.